When Governor Wolf finally relented and allowed one of the four state budgets passed by the Legislature to become law in March, there was a sense of relief that school districts would finally receive the funding that been held hostage for so long. But that relief was short-lived when the Governor implemented his own formula for distributing money for public education – one that picks only a few winners while providing less money to most areas of the state – including my Senate District. Rather than using a distribution formula established by a bipartisan Basic Education Funding Commission, the Governor created his own politically driven plan that cut millions of dollars from rural and suburban districts. This distribution is anything but fair and it could result in higher taxes and cuts in school programs here in my district and many other areas of the state. Gov. Wolf’s plan cut more than $7.3 million in funding for schools in my Senate District. Centre County schools alone were cut by more than $3 million. Bald Eagle Area School District was cut by about $1.25 million; Bellefonte Area School District by about $744,000; Penns Valley Area School District by about $582,000; State College Area School District by about $522,000 and Philipsburg-Osceola Area School District by about $258,000. Under the Governor’s distribution scheme, three school districts will receive $100 million out of the $200 million in new education money, leaving 497 school districts such as ours to split the leftovers. Philadelphia School District alone will receive $77 million, which is $34 million more than under the fair funding formula. It is hard to understand why the governor would choose to disregard a formula that was designed to bring more equity to education funding in the Commonwealth. It was developed after months of public hearings and cooperation among lawmakers, school administrators, education advocates, teachers and parents. The Governor even praised the Commission, its findings and its formula – only to ignore it in favor of his politically driven plan. To make matters worse, Gov. Wolf also cut funding for a program, commonly known as PlanCon, which would have provided reimbursements to districts for school construction and renovation projects. School districts were counting on this money and if it is not restored taxpayers may bear the burden in higher taxes. To reinstate our fair funding formula, the Legislature approved a new fiscal code, House Bill 1589, which would restore funding to school districts, including those in this area, which the governor tried to cut. The bill restored a total $439 million in school funding – $150 million for instruction and another $289 million for PlanCON school construction and renovation. Schools shouldn’t be subject to the Governor’s political whims – their mission is far too important. I urge Governor Wolf to put aside his partisanship and agree to fair funding for all our schools. By signing House Bill 1589, the Governor will not only be restoring vital funding to schools caught up in the state budget drama, he’ll be essentially closing the book on the 2015-16 budget debacle, allowing us to focus on enacting a responsible 2016-17 spending plan. I urge the Governor to right this wrong and sign House Bill 1589. This week, legislation to permit the use of medical cannabis in Pennsylvania for limited medical conditions was signed into law at the state capitol. My colleague Senator Mike Folmer (R-Lebanon) was a driving force behind this law which will help many people, including children with seizure disorders and others who are in need of life-saving treatments for debilitating medical conditions. I applaud his efforts to organize grassroots support for this legislation and to change hearts and minds on this issue. Senate Bill 3 establishes a state program under the Department of Health that creates a network of growers, processors and dispensaries and allows doctors to certify a patient to receive medical cannabis for certain medical conditions, including cancer, amyotrophic lateral sclerosis (ALS), Parkinson’s disease and multiple sclerosis. The bill is restricted to medicinal use through oils and tinctures and is not permitted to be smoked. It was amended in the Senate to give dispensaries clearer authorization to operate and add stronger oversight for employees of medical cannabis organizations. On Thursday, April 21st, the Center for Rural Pennsylvania will hold its ninth public hearing at Geisinger-Lewistown to gather information as to how the heroin/opioid epidemic is affecting some of Pennsylvania’s most rural and remote counties. The hearing will examine and discuss current policies and practices related to heroin and opioid addiction, including prevention, treatment and law enforcement efforts. In Pennsylvania, the number of fatal heroin overdoses has been steadily increasing. According to a 2014 report from the Pennsylvania State Coroners Association, there were 45 reported heroin deaths in 2009 and 124 reported heroin deaths by mid-2013. Other states across the nation are reporting an increase in heroin use as addicts are shifting from more costly prescription opioids to cheaper alternatives. I recently sat down with Senator Gene Yaw (R-Williamsport) and Barry Denk, Executive Director of the Center for Rural Pennsylvania to talk about this growing crisis and how we can save lives. 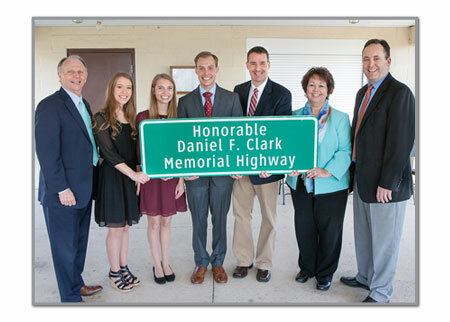 A portion of Route 22/322 in Juniata County was formally renamed the Honorable Daniel F. Clark Memorial Highway during a ceremony last week in Mifflintown. I was joined at the ceremony by state and local officials, family members of the late state representative and State Representatives Bill Adolph and Adam Harris. Representative Clark served the 82nd District in the House from 1989 to 2002, which includes all or portions of Franklin, Juniata and Mifflin counties. He passed away in September of 2014. In the 1990s, Dan worked tirelessly in Harrisburg to get the votes to improve the local highways. His efforts not only improved the community and spurred economic development, but it saved lives. This highway designation is a way to honor Clark’s memory and serve as a tribute to his years of public service to the area.